I joined Joe Conzo on host Gary Axelbank’s show Bronx Buzz on Bronxnet TV to announce the publication of our forthcoming book, 111 Places in the Bronx That You Must Not Miss (Emons). The book publication date was moved up to mid-May and we made our first TV appearance to talk about the book. It is part of the international hit series 111 Places. I’ve been talking a little about it on our podcast, Joanna and Kevin’s Big Show, but this was nice to have a wider audience on TV. Joe is an amazing photographer and I’m so lucky to work with him on the book. I started working on the book two years ago, but the majority of the writing was over the last seven months. The book explores every neighborhood of the borough, and has locations famous and obscure. It was so much fun to explore and research bars, churches, history, restaurants, and more. Working with Joe was a dream. 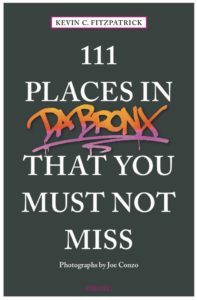 I can’t wait for you to read 111 Places in the Bronx That You Must Not Miss. This entry was posted in Books, News and tagged 111 Places in the Bronx That You Must Not Miss, Books, Bronx, Joe Conzo by Kevin Fitzpatrick. Bookmark the permalink.